Joining a gym can be an intimidating and rather daunting experience, even for those of us who have been to a gym before and even more so for those of us who are entering a gym for the first time. At first, you feel as though you are surrounded by people who know exactly what they are doing, while you feel awkward and somewhat unsure where to start. Whether you are overwhelmed by the sight of the unshakable fitness fanatics surrounding you, or if you are in some sort of paralysis at the sight of the numerous machines that just seem so daunting, don’t let these thoughts keep you from starting your fitness journey. Based on our experience in the fitness industry, here are some tips and tricks to help you feel more comfortable at the gym. Take advantage of the introductory personal training session. At F1rst Class Fitness, our new members can take advantage of a wants and needs assessment followed by a workout with a certified F1rst Class Fitness Personal Trainer. Our advice is to use this time wisely and make sure that you have a simple understanding of how to use the cardio and strength equipment. Sure, the Personal Trainer might want you to embark on ongoing personal training sessions with them, but they also really want you to have some knowledge, feel comfortable and be safe while you exercise. The best thing you can do is to be prepared for this session and ask heaps of questions. Think of it as your chance to feel a little more confident about the gym equipment and a basic plan for what to do when you work out on your own. Sign up for a few personal training sessions. Now, for those of you who have no experience with weight training, cardio equipment or how to structure an effective workout, it is a really good idea to take a few sessions with a certified personal trainer. During these sessions, a F1rst Class Fitness Personal Trainer can develop a program for you based on your goals, wants and needs, and then help you feel comfortable using both the machines and the free weights. A personal trainer should ask you about your health and exercise history, any physical limitations or restrictions that you might have, and goals you hope to achieve. The primary role a personal trainer plays is they create a plan to get you from your actual state to your desired state in the shortest time possible whilst avoiding injury. Whether you want to lose weight, prepare for an important occasion, or generally feel stronger and healthier, a personal trainer is probably the key to your success. Take a group fitness class. Taking a group fitness class is a great way to get started at the gym. Find a class that sounds interesting and give it a go. From circuit training to dance inspired classes, strength orientated classes to cardio based sessions and everything in between, F1rst Class Fitness has choices that not only will help you get fit, they will give you the opportunity to meet other members and feel comfortable in the group atmosphere. On your first visit try to arrive early and take the opportunity to introduce yourself to the instructor. Let her know any restrictions or limitations you might have and that you are new to the gym and this is your first group fitness session. Please never hide yourself at the back of the class no matter how tempting that may sound! The closer you are to the front the better you will see the instructor and she / he can better correct your movements and keep you engaged in the class. Trust us when we say that this participation and involvement with the gym community, and by following the structure of a class can change your perspective on a dime. Do some research. It really does not matter if you are a beginner or an advanced trainer, take the time to do some research about what you should be doing at the gym and how to avoid injury. There are numerous online resources that will tell you how to do certain exercises safely and how to exercise for an intended purpose but you need to find a reliable source. By doing this, you should be able to create a balanced workout that you enjoy and challenges you in the right way. Go at a quiet time. Early morning, midday and evenings are the busy times at any gym as exercisers get their workouts in before heading off to work, during their lunch break, or on their way home at the end of the day. The equipment may be in use and the gym may be crowded. If you have the option, try visiting the gym in the late morning or early afternoon. That is the quietest time at the gym, which creates a comfortable atmosphere. 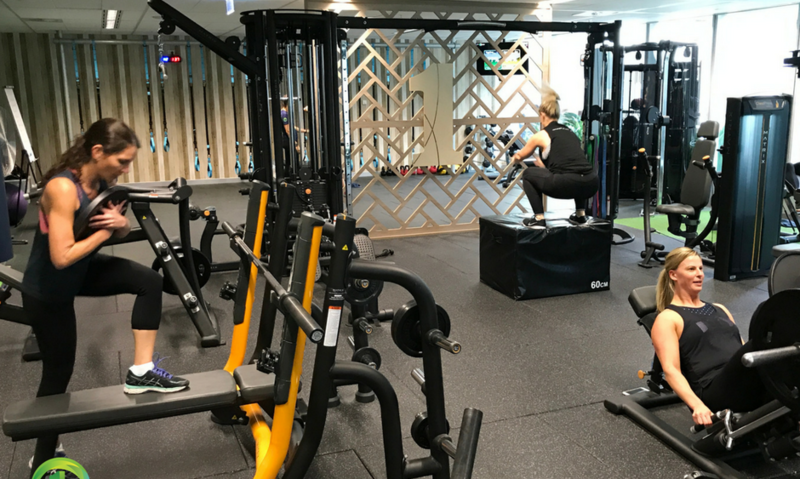 You can take more time to try out different equipment and explore the variety of machines without the pressure of other gym goers in the area. Bring a friend. Have you ever heard the saying ‘safety in numbers’? Well, we couldn’t agree more! Having a friend beside you not only helps you feel more safe and secure in a new and unfamiliar environment, it’s also a great accountability system. Bringing a friend along to the gym will help you to feel more comfortable and if your friend has fitness experience, she or he can help you learn a little more about working out. If you are both beginners you can learn the ropes together. Have a plan. Perhaps the most common mistake with new gym goers is they walk into the gym and drift around looking for machines to try. A day or two beforehand, create a workout plan, which can vary from day to day depending on your goals. One day you may want to focus on cardio, so start out on the treadmill, stepper machine or stationary bike and then progress to some sled work or battle ropes. Another day you may like to tackle a total body strength workout, using Barbells for the upper or lower body. The point here is to have a plan. It really doesn’t matter what you do as long as you’re moving. Learn gym etiquette. There certainly are some protocols expected of gym-goers, and once you learn what they are you will be on your way to fitting in. Perhaps the most important ones include replacing weights when you’re finished with them, wiping down equipment after use, and being mindful and considerate when using equipment. It really is that easy, be considerate, and you will be surprised at the smiles and kind gestures that come your way. Remember that everyone once stood in your shoes. It’s essential to remember that everyone has had first-timer nerves at one time or another. We have all had to start somewhere on something that was unfamiliar. People generally understand your discomfort when they see you are unfamiliar or intimidated by new surroundings and are happy to answer questions, or show you how to do things like start the treadmill or stepper. Now finally, there is one final and very important thing to note about feeling uncomfortable or intimidated at the gym…. No one cares. I know this sounds confronting and is perhaps a little direct, but what we mean by this is that everyone is simply concerned with doing their own workout and overcoming their own insecurities. We all have them, I certainly do, and that is what we are truly focused on. We don’t notice when you have to read the instructions on the leg press, or that you’re wearing an old T-shirt. Despite your fears, no one is watching you. They really aren’t! I agree, while walking into a gym for the first time can be a scary experience, following these tips will help you ease into the experience and feel comfortable in a gym environment, anywhere. Also, our friendly staff at F1rst Class Fitness will always be happy to assist with machinery queries or any fitness related questions you may have. Remember, we all started somewhere too! Previous Post Keep It Simple & Get Results.